The intervertebral disc (IVD) is important in the normal functioning of the spine. It is a cushion of fibrocartilage and the principal joint between two vertebrae in the spinal column. There are 23 discs in the human spine: 6 in the cervical region (neck), 12 in the thoracic region (middle back), and 5 in the lumbar region (lower back). • two vertebral endplates (VEPs). 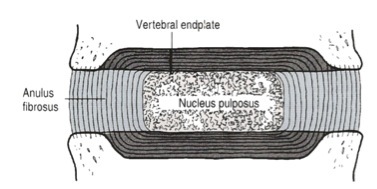 Nucleus Pulposus: a gel-like mass composed of water and proteoglycans held by randomly arranged fibres of collagen   . With it’s water-attracting properties, any attempt to deform the nucleus causes the applied pressure to be dispersed into various directions, similar to a person on a waterbed. Annulus Fibrosus: consists of “lamellae” or concentric layers of collagen fibres . The fibre orientation of each layer of lamellae alternate and therefore allow effective resistance of multidirectional movements. 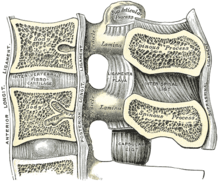 Vertebral endplate: a plate of cartilage that acts as a barrier between the disc and the vertebral body. They cover the superior and inferior aspects of the annulus fibrosus and the nucleus pulposus. The disc is innervated in the outer few millimetres of the annulus fibrosus . The IVD is largely avascular, with no major arterial branches to the disc . The outer annular layers are supplied by small branches from metaphysial arteries . Due to the avascular nature of the disc, the nutrition is dependent on metabolite diffusion   . Weight bearing: The disc is subjected to various loads, including compressive, tensile and shear stresses  . During compressive loading, hydrostatic pressure develops within the NP, which thereby disperses the forces towards the endplates as well as the AF   . This mechanism slows the rate applied loads are transmitted to the adjacent vertebra, giving the disc its shock absorbing abilities . Nuclear migration: Asymmetric compressive loading disc can cause the NP to migrate in a direction opposite to the compression    . For example, during forward bending (or flexion) of the lumbar spine, the NP migrates posteriorly or backwards (Figure 4). Conversely, during backwards bending (or extension), the nucleus is squeezed anteriorly or forwards. This concept is known as the dynamic disc model . Although NP migration has been shown to behave predictably in asymptomatic discs, a variable pattern of migration occurs in people with symptomatic and/or degenerative IVDs . Refer to Lumbar discogenic pain and Thoracic disc syndrome. Refer to Lumbar discogenic pain. Bogduk, N., Clinical anatomy of the lumbar spine and sacrum. 4th ed. 2005, New York: Churchill Livingstone. ↑ Bogduk, N., Clinical anatomy of the lumbar spine and sacrum. 4th ed. 2005, New York: Churchill Livingstone. ↑ Gruber, H.E. and E.N. Hanley, Jr., Recent advances in disc cell biology. Spine (Phila Pa 1976), 2003. 28(2): p. 186-93. ↑ Humzah, M.D. and R.W. Soames, Human intervertebral disc: structure and function. Anat Rec, 1988. 220(4): p. 337-56. ↑ Marchand, F. and A.M. Ahmed, Investigation of the laminate structure of lumbar disc anulus fibrosus. Spine (Phila Pa 1976), 1990. 15(5): p. 402-10. ↑ Roberts, S., et al., Histology and pathology of the human intervertebral disc. J Bone Joint Surg Am, 2006. 88 Suppl 2(Supplement 2): p. 10-4. ↑ Urban, J.P., et al., Nutrition of the intervertebral disk. An in vivo study of solute transport. Clin Orthop Relat Res, 1977(129): p. 101-14. ↑ Urban, J., S. Holm, and A. Maroudas, Diffusion of small solutes into the intervertebral disc. Biorheology, 1978. 15(3-4): p. 203-21. ↑ Urban, J.P., S. Smith, and J.C. Fairbank, Nutrition of the intervertebral disc. Spine (Phila Pa 1976), 2004. 29(23): p. 2700-9. ↑ Stokes, I. and J. Iatridis, Mechanical conditions that accelerate intervertebral disc degeneration: overload versus immobilization. Spine (Phila Pa 1976), 2004. 29(23): p. 2724-32. ↑ White, A.A. and M.M. Panjabi, Clinical biomechanics of the spine. Vol. 446. 1990: Lippincott Philadelphia. ↑ 12.0 12.1 Reuber, M., et al., Bulging of lumbar intervertebral disks. J Biomech Eng, 1982. 104(3): p. 187-92. ↑ Broberg, K.B., On the mechanical behaviour of intervertebral discs. Spine (Phila Pa 1976), 1983. 8(2): p. 151-65. ↑ 14.0 14.1 Shah, J.S., W.G. Hampson, and M.I. Jayson, The distribution of surface strain in the cadaveric lumbar spine. J Bone Joint Surg Br, 1978. 60-B(2): p. 246-51. ↑ Krag, M.H., et al., Internal displacement distribution from in vitro loading of human thoracic and lumbar spinal motion segments: experimental results and theoretical predictions. Spine (Phila Pa 1976), 1987. 12(10): p. 1001-7. ↑ Schnebel, B.E., et al., A digitizing technique for the study of movement of intradiscal dye in response to flexion and extension of the lumbar spine. Spine (Phila Pa 1976), 1988. 13(3): p. 309-12. ↑ Fennell, A., A. Jones, and D. Hukins, Migration of the nucleus pulposus within the intervertebral disc during flexion and extension of the spine. Spine (Phila Pa 1976), 1996. 21(23): p. 2753-7. ↑ 18.0 18.1 Kolber, M.J. and W.J. Hanney, The dynamic disc model: a systematic review of the literature. Phys Ther Rev, 2009. 14(3): p. 181-189. ↑ Fardon DF. Milette PC. Nomenclature and Classification of Lumbar disc Pathology. Spine 2001;26:E93-E113.